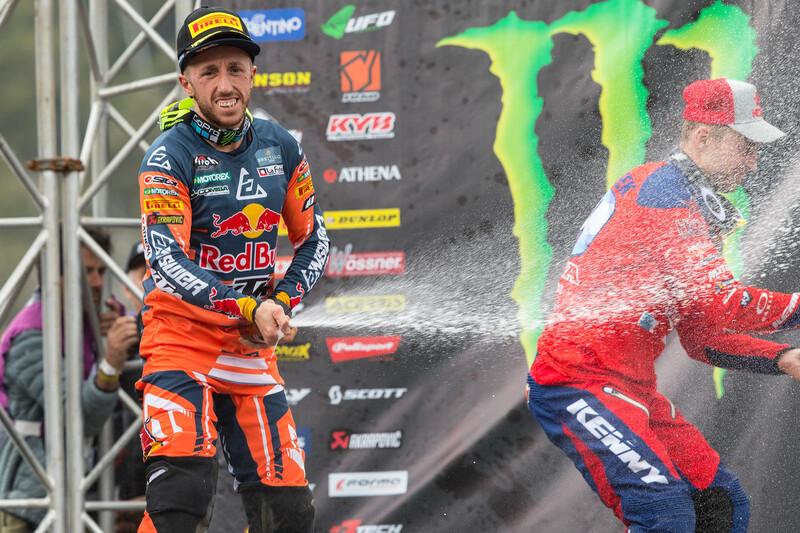 Red Bull KTM Factory rider Antonio Cairoli showed brilliance once again as he won the opening round of the 2019 MXGP championship. Incredibly it was the 16 year that the Italian legend has won a Grand Prix, a record that will stand for many years you would think. After a disappointing Saturday, with bike problems and a slight lack of speed, Cairoli burst into life on Sunday, and despite his horrible starting gate position, he made it all happen and walked away with his 86th GP win. Well done. Tim and Romain showed a lot of speed early, and on some occasions, it looked like you were on your limit to keep with them. Was that the goal to keep with them early and then take over the race later? No, but for sure, the speed was high, and they have improved from last year of course. I think they are faster and I still need to know their limit. I was watching their speed and I was pushing of course, but I wasn’t on the limit. I like this track a lot, but it is very fast, and a lot of berms everywhere, so it is easy to go fast you know. So it is really strange to change rhythm, you think you are going fast already, but you can actually go faster and I had this at the end and I could push and move away from them and go for the win. This weekend you set yourself up with that bad gate pick. I am happy overall because after yesterday I wasn’t sure about the start. There isn’t much different and hard to gain. I got two good starts, both in the top ten, first moto even five even. I fought hard in that second moto and I could watch some good lines from the guys in front and took the overall. I was looking forward to this win on this track. It was a high rhythm and I was there, trying to see where I could gain some time. I saw Tim and I was doing different lines and I didn’t want to do it but decided to push in this part and I could stay close and make the pass. That battle and pass in the second moto. Watching it looked amazing, was it nice being part of that battle? Yes, it was nice, but it was high speed and that wave section with Romain, because we were very close and it was a bit sketchy. I found a line and passed, fortunately, we didn’t’ touch, and I could make the pass on the landing on the table. It was nice to see this for the public and if it stays clean it is nice. Is this Grand Prix a little like a home GP for you, because the crowd seem to love you? Yes, it is, and it’s unbelievable. I can’t go around in the city and it’s even worse than in Sicily when I do the Italian championship. I like it a lot, but it is hard to match. I can’t walk around much and I can’t watch the track a lot, but I like it, and it’s great to have such a feeling so far from home. You showed emotion after the win, it was nice to see. Why was there so much emotion? Actually, for me, I am a warm guy and I always show emotion in a country like this, where they are also warm. It was nice to give them a win and I was close last year, but it’s nice to race where people don’t see you all the time. Tony started his bid for a record matching 10th World Championship off the right way. Do you know what happened with the bike yesterday? No, we didn’t check, so we need to do that. That must have made you very uncomfortable coming into today? Yes, of course, because my goal is always to stay in front and my starts….you need to start in front because the pace of the front riders is very fast and it’s difficult to make the pass and go for the win. Starting from so far on the outside, I need to use all my skills in the start and try and do the first corner as fast as possible. The first moto it was a perfect start, but the second moto I had some sketchy moment in the first corners. I survived and come up after half a lap in the top six and I was happy and could build on that and win the race. Jorge said the track is so fast that it is hard to make up time and doesn’t really separate the riders very much. Is that how you felt? You can always make some difference, but some tracks you can do it with technique, some tracks with physical condition, but with this track, you can only do it opening the throttle, and like I said, some tracks you can win with technique and fitness when people start dropping times. I mean here, Tim and I had the same times and then it is difficult to make a difference. Jeffrey is obviously out, and nobody wants to see a rider out injured, did that change your mind-set at all? No, it didn’t change my mindset, it’s a World Championship and there is always something can happen to somebody. So my goal was to fight him, and I prepared for this, I had a good winter and I did a good preparation and unfortunately, this happened to him. We are always on the limit and injury is around the corner, especially how we were riding last year. If you lose a bit of concentration and you crash, at this speed, you crash hard. Nobody wants this to happen, and I hope he is back soon.